Winter is the best time to see waterfowl in their peak plumage and often in super large numbers. There are waterfowl hotspots around the country, and we have selected a few from various parts of the US so you can plan your own winter waterfowl outing. Known for its extraordinary spectacle of thousands of Snow Geese making a sunrise take-off from the lake, this refuge, originally established in 1939 as a haven for waterfowl, doesn’t disappoint. There are hundreds of Sandhill Cranes as well as smaller numbers of a variety of waterfowl. Arrive before dawn for the best viewing, then take the auto or hiking trails for more birds throughout the day. Located 90 minutes south of Albuquerque, and 2 ½ hours from El Paso. 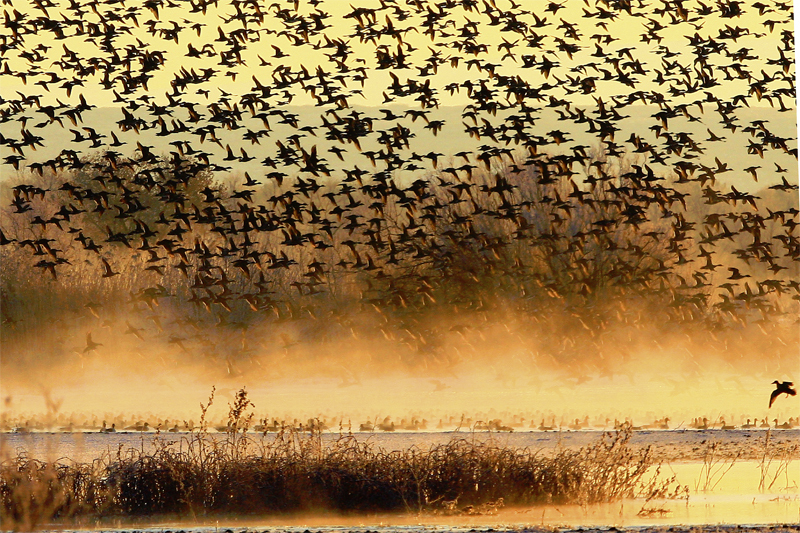 Get your fill of waterfowl in winter by visiting this mid-west national wildlife refuge which provides habitat for 60 to 70% of the waterfowl that migrate along the Illinois River corridor. Check out the north and south pools for diving and dabbling ducks. With a waterfowl list of 28 species, depending on when you are there, you may see dozens of species of birds including hundreds of Common Goldeneye, thousands of White-fronted Geese, and maybe even a recent high number of 15,000 Snow Geese. Located about 3 hours from Chicago and 2 ½ hours from St.Louis. You may think of this refuge as the place to see wild ponies, but in winter you can make the rounds for waterfowl. Originally established as a place to protect Snow Geese, now you can also find Tundra Swans, Northern Northern Pintails, Gadwals and all sorts of diving and dabbling ducks which stop here in winter. Located about 2 hours from Norfolk and 3 or so hours from Washington DC, Baltimore and Philadelphia.